Getting there: Located in Olive Township on Stanton Road between 128th and 120th Avenues. From US 31, take Stanton Road and travel 3 miles east to the park entrance. From 120th Avenue, travel west on Stanton about 1/2 mile. What's there: Tucked away in the middle of the county, this park offers a quiet retreat for the outdoor enthusiast. Pigeon Creek Park is 282 acres with another 130 adjacent acres of County Open Space land. Over 10 miles of trails wind through old pine plantations, mature deciduous forests and through bottomland forests along the Pigeon River. 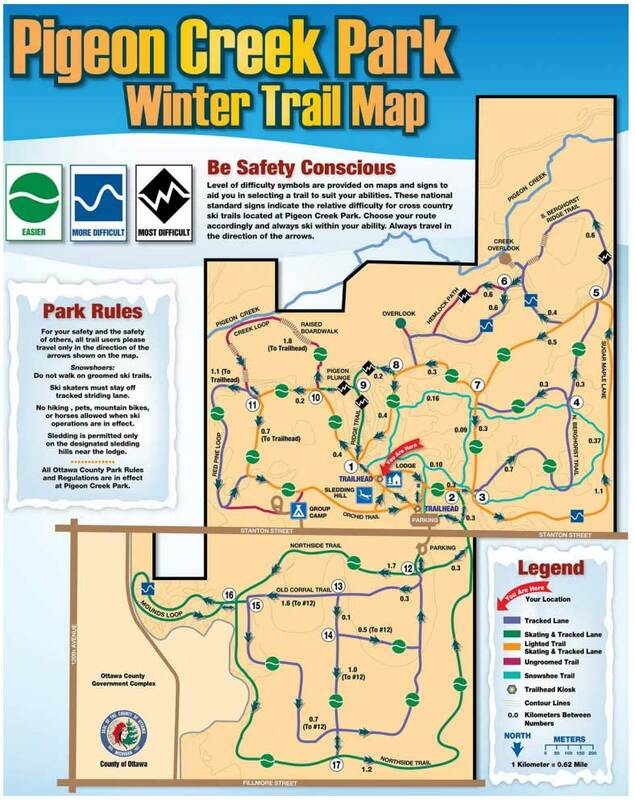 The trail system includes designated trails for hiking, biking and equestrian use and a 0.9 mile trail loop that is generally within barrier free standards. During the winter, this park is a popular cross country ski destination with groomed trails for both classic and ski skating. A sledding hill is also provided. Three miles of ski trails and the sledding hill have lights for night use. The Pigeon Creek Lodge provides ski rental, a food and beverage concession and serves as a warming house (open limited hours). 16 K of groomed x-c ski trails with diagonal and skating lanes, 3 miles of lighted x-c ski trails, sledding hill, x-c ski rentals and warming lodge. Cross-country and skate ski lessons are available on Tuesdays, Thursdays, and Saturdays during January and February. Preregistration is required and space is limited. The word is that Pigeon Creek is well groomed, but heavily traveled. They're good at grooming with low snow cover, but when the masses hit the trails, the sand gets churned up quickly.